Compatible with devices running Android 4.0 and later. Version reviewed: 1.4.1. 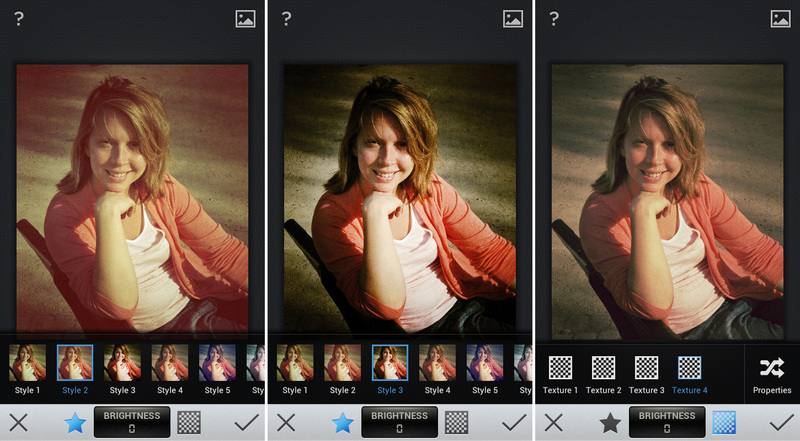 Snapseed’s photo editing love isn’t just for iOS anymore. 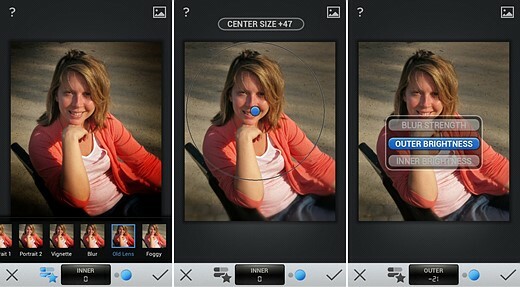 The app now brings its control points and filters to Android, with a new emphasis on Google’s favorite social network. When Google bought Nik Software, maker of the popular Snapseed photo editor for iOS, it wasn’t hard to predict that Android users would eventually get a taste of that app’s powerful image optimization tools. The wait is now over. This is good news for the Android app ecosystem, which is light on “serious” photo editors. 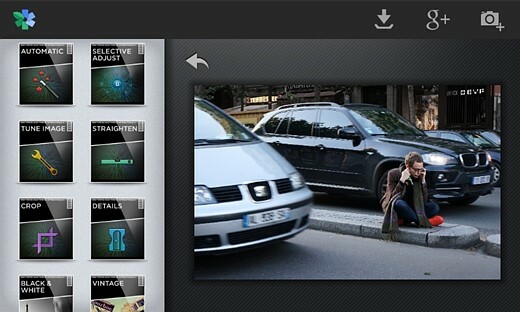 Snapseed’s iOS incarnation won Apple’s best iPad App of the Year award in 2011. Photojournalist Dan Chung used the app extensively while photographing the 2012 Olympic Games in London with his iPhone for The Guardian. 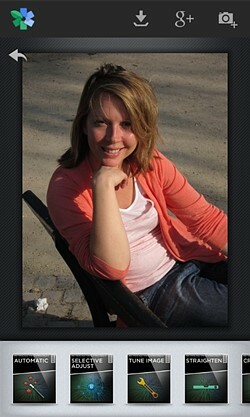 The iOS app has a loyal following: we’ll see if the Android version deserves the same. Along with Snapseed’s arrival on Android, the iOS version also got a refresh, and in true Google style the app is now free for both platforms (it originally cost $4.99 in the Apple App Store). Since you’re probably not interested in tweaking the included sample photo of dead trees, the first thing you’ll do is hit the camera button. This offers the choice of taking a photo with the Android camera app or picking one from your Gallery (or other file browsers if you have any installed). 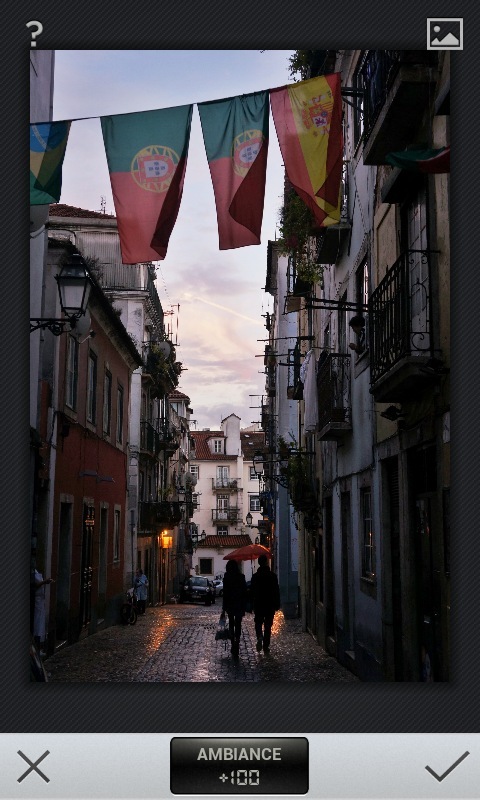 The thumbnails tend to be miniscule, so you may prefer starting within your Gallery (which offers more browsing flexibility) and opening a photo from there by using the Edit option. You might run into Snapseed’s image size limitation. On phones, anything more than 8 megapixels gets scaled down, which probably won’t pinch unless you’re using one of Sony’s high-megapixel Android handsets. On tablets, the cut-off is 16 megapixels, easily exceeded by a slew of digital cameras. The iOS limits are more variable depending on device, ranging from 6.25 megapixels on the iPhone 3GS and the original iPad, up to 22.25 megapixels for the latest iPads. Snapseed’s functions are grouped in labeled icons along the bottom or side of the screen. The order doesn’t always make sense, but the first item is the Automatic tool, which applies a quick correction to the image. ... the adjustment has pushed up the contrast and added a greenish tint, neither of which we’d consider an improvement. It’s subtle and sometimes it works fine, but it can also flub the job, as it did with our test image above. 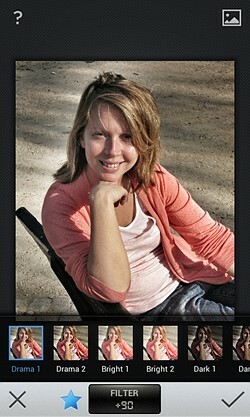 You can tweak the automatic correction, and here we meet the heart of Snapseed’s ingenious touch-optimized interface. The current parameter to be changed, contrast, is reported at the bottom of the screen. Sliding your finger left and right increases and decreases the value. Sliding vertically brings up the list of parameters for that tool (if any) and allows you to select one. There are no sliders to aim at in Snapseed. Moving your finger horizontally (as we’re doing above) changes the current parameter. Sliding vertically (again, anywhere on the image) changes the current parameter: here we can choose between contrast and color corrections. It’s a brilliant interface, though the results in the Automatic tool are confusing. 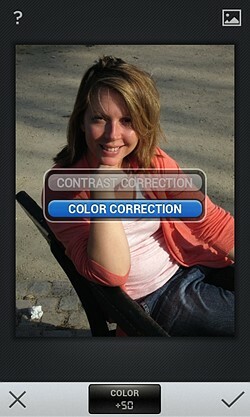 Changing contrast influences color, and the “color correction” is actually an adjustment of how much the contrast parameter shifts color. Got that? By the way, the question mark icon at the top left calls up basic contextual help, but it’s no help for subtleties like this, which must be solved via experimentation and web browsing. The basics do what you’d expect, including white balance, which is something not all mobile apps get right. and warm up the color balance. 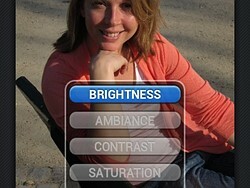 The Ambience control is a Nik specialty, a sort of smart contrast adjustment. It’s great. 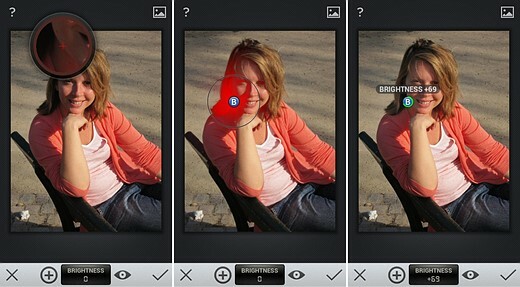 Digital photos in general, and especially images from the tiny sensors in phones, often suffer from exaggerated contrast: darker areas are buried in shadows, while bright areas are close to blowing out. Adding Ambience reduces that contrast without making things look flat, much like a judicious application of Photoshop’s Shadows/Highlights tool. The only caveat is that the adjustment can overheat skin tones, but that’s easily addressed by backing down the saturation a bit. Snapseed’s “Ambience” smart contrast control brightens shadows and pulls down highlights, remedying the common woe of overly-contrasty images. The original shot, above. A heavy dose of Ambience has been applied above brightening the street while pulling detail out of the overly-bright sky. Snapseed inherits the control points of Nik’s venerable desktop software, which happen to be an excellent approach to localized edits on small touch screens. They’re under the Selective Adjust tool category. You add a point by tapping the plus sign and then touching the image. You then adjust the area to be affected by pinching. Finally, select a parameter (brightness, contrast or saturation) by sliding vertically and apply it by sliding horizontally. Under Selective Adjust, tap the plus sign and then tap and hold to get a loupe view of where the control point will be. Release to place the point (left). Now pinch to adjust the effect radius (center). Slide to apply the effect (right). The center image above shows the magic of control points. It’s not simply a circular effect zone. Nik’s algorithms only apply the effect to areas within the selected radius that also match the control point’s center. 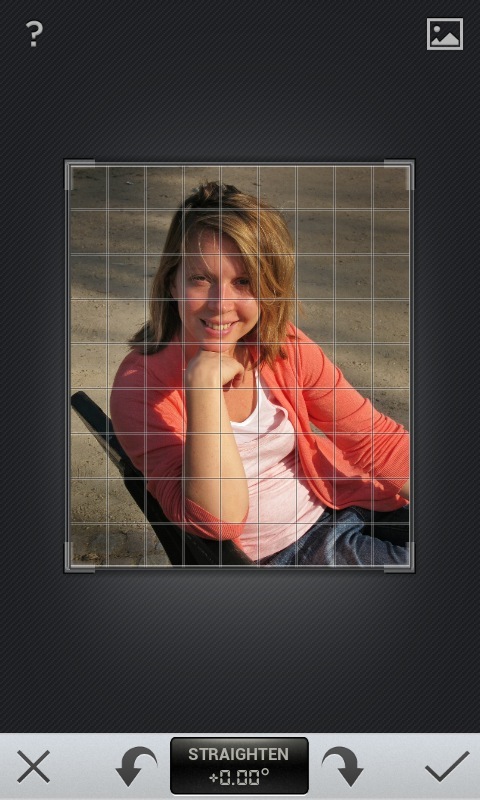 In this case, the shadows of the face and hair are “selected,” but the skin within the radius preview is not. This behavior lets you target adjustments very specifically without a laborious selection process. 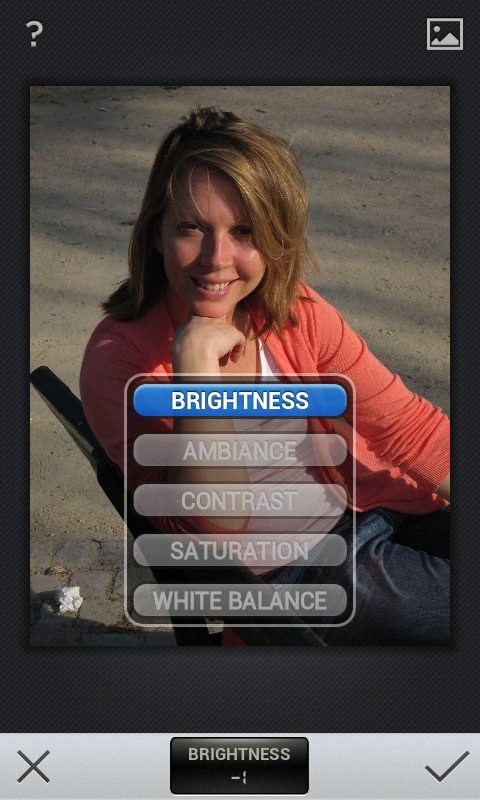 Each control point can affect three parameters: brightness, contrast and saturation. 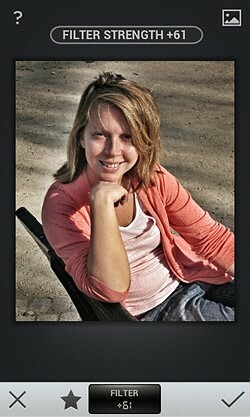 we’ll also bump up the contrast to avoid a flat look in the brightened area. Control points are perfect for bringing out detail in shadow areas, and toning down bright areas to focus attention where you want it. Technically they should be useful for taming highlights, but in practice lowering the brightness for this purpose tends to produce a flat, unnatural look that’s only partially offset by increasing contrast. The global Ambience adjustment does a better job. Which brings us to our main complaint about control points: they don’t control enough. It would be great to be able to do targeted Ambience or white balance adjustments, but you can’t. Proceeding along the list of tools, we come to Crop and Straighten. Both do what they’re supposed to. The cropping tool has presets (unusually, including “DIN,” for the European A-series paper ratio) and freehand options. The rotate tool allows 90 degree turns as well as fractional degree adjustments. The Details tool is where you’ll find sharpening options, and where one of Snapseed’s biggest failings becomes apparent. You get traditional sharpening and Nik’s Structure adjustment, which aims to bring out textures and details without introducing sharpening artifacts. The fly in the ointment is that you can’t zoom in on the image to see what’s really happening. There’s a magnifying loupe, but it’s not the same. It would be really nice to be able to zoom in for more precision editing at other steps of the editing process as well, but sharpening is where the devil is truly in the details. The requisite filters are here, and they’re quite flexible. The black and white effect has a few presets and the option to simulate color filters. A number of presets make black and white conversions a one-touch affair. 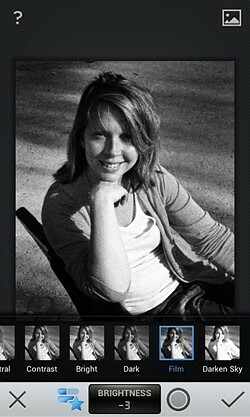 Snapseed also simulates color filters on black and white film: here, the orange filter creates flattering skin tones. Next up is the Vintage filter tool, with nine preset styles and four texture overlays. Snapseed’s Vintage offerings: nine filter presets and four fairly subtle texture overlays. The Drama filter forges into more original territory. It has six presets, and horizontal swiping adjusts the strength of the effect, proving a lot more flexible than simple on or off options. and the welcome option to scale them for desired effect. If you don’t like being able to identify what’s in your photos, then Snapseed’s Grunge filter was made for you. Here, there are no presets, just a choice of 1,500 subtle gradations to swipe through, along with more aggressive textures. makes photos look like they’ve spent time in a flooded basement. If there’s still too much detail visible after a thorough filtering, Snapseed’s very capable Center Blur tool can further obfuscate your photo. Starting with a number of presets, you can adjust not only the position of the blur effect and its radius, but also the strength of the blur and the brightness inside and outside the blur circle. 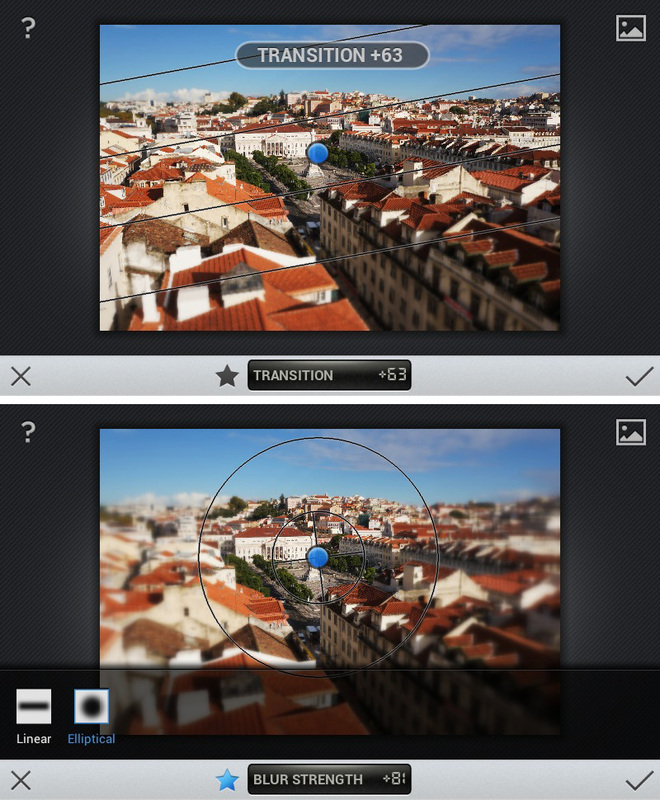 Snapseed’s Center Blur tool gets started with six presets (left), lets you place the center of focus and its radius (middle), and allows various parameters to be adjusted. Also in the blur family is the Tilt-Shift tool, which is again highly configurable. You can adjust not only the width of the in-focus region, but also the width of the area where the image transitions to out of focus and (as above) the degree of blur. There’s also a radial blur option, unusual in a mobile app. Snapseed’s tilt-shift simulator is unusually configurable, with adjustments for the size of the transition area and the overall blur strength. Snapseed’s Frames tool adds a border to a photo, with variable width and offset. with adjustable width and offset. Unfortunately, the Android version of Snapseed doesn’t get the expanded frame selection that was added to the iOS app. It also misses out on the new Retrolux filters, which simulate old films. Google+ gets a shortcut on the main screen, Google’s way of saying: “Enjoy this free app, and check out our social network while you’re at it.” Picasa is relegated to the Share menu like a shamed puppy, along with all the apps on your device that are set up to receive images (which will probably include Facebook and Twitter) and antiquated technologies like email and MMS. Snapseed is a polished and powerful photo editor. It’s a standout in the iOS environment, and in the Android ecosystem it’s easily among the best general-purpose editors available. Its greatest strength lies in the versatility of its control point system, which makes targeted adjustments fast and easy, even on the small screen of a phone. Its smart contrast enhancement is also extremely useful for brightening murky areas of a photo and reining in over-exuberant highlights. There remains room for improvement. The inability to zoom in on images is the most serious failing, and is especially irksome when working within the constraints of a phone screen. The control point system could also be improved by giving it more adjustable parameters. Changes are “destructive,” meaning you can’t undo once you’ve applied them (though you can always revert completely to the original image). Help could occasionally be more helpful, and the Automatic correction can inspire manual override. All that said, Snapseed’s strengths far, far outweigh its (hopefully temporary) weaknesses. 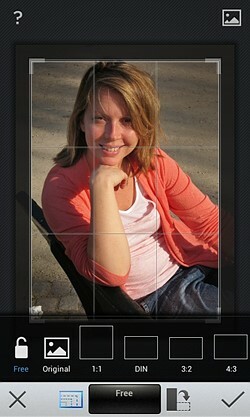 Anyone even slightly serious about mobile photo optimization should include this app in their toolkit. What we like: Touch-friendly, interface well-suited to small screens; powerful control points enable practical localized edits; good global adjustments including useful smart contrast correction; highly configurable filters and blur effects. What we don’t like: Inability to zoom in on images; control points could do even more; can’t undo applied changes. 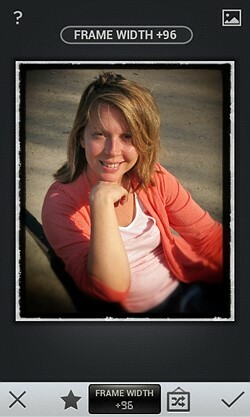 Changes aren't destructive if you always have the originals still intact, which is the case with Snapseed. It only will export or save additional images, not overwrite the originals. "Non-destructive" image editing was really popularized by Adobe Lightroom. In comparison, Adobe Photoshop will easily allow you to "CTRL-S" to save right over the original, LR will not. It isn't a worry in Snapseed, your originals are safe.